1 of 4 In a large pot bring broth and 3 cups water to a simmer. 2 of 4 In a second large heavy-bottom pot, heat oil over medium heat. Add onion; cook 3 minutes. Add garlic; cook 2 minutes. 3 of 4 Add rice to onion, stirring to evenly coat with the oil; cook 1 minute. Add wine and salt. Cook, stirring constantly until wine is absorbed, about 3 minutes. 4 of 4 Add 2 cups of the broth mixture to rice and stir until liquid is absorbed. Add remaining broth mixture, 1 cup at a time. Stir continuously until all the broth is absorbed before adding the next cup. Stir in corn after 20 minutes. All the broth mixture should be absorbed after about 25 to 30 minutes of cooking time. Stir in thawed corn during last 5 minutes of cooking. Remove 6 cups of risotto for use in Black Bean Risotto Cakes and Stuffed Peppers recipes in database. To the remaining 3 cups risotto, stir in the Parmesan cheese and parsley. Cover and keep warm. 1 of 2 In a large skillet heat oil. Add garlic and shrimp and season with the salt and pepper. Saute about 2 minutes per side. 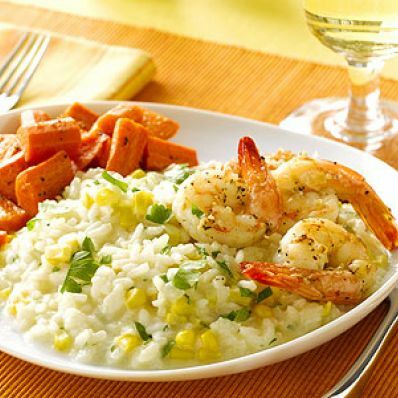 2 of 2 Serve the risotto with the shrimp and half of the roasted carrots.